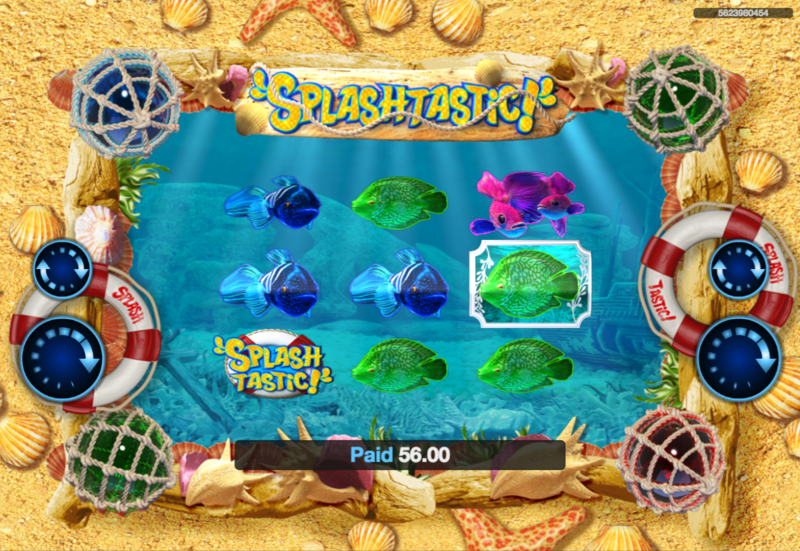 Deep beneath the ocean waves live a variety of multicoloured fish whose one aim in life is to rearrange themselves into neat lines to try and win you some money; that’s the premise of Splashtastic!, an online slot from Realistic Games with extra features squeezed into just three reels – read on to find out more. Splashtastic! is a three reel slot with three rows and five fixed paylines; the fishy symbols float near the sunlit ocean bed while around the outside there are shells, glass objects and lifebuoys to complete the nautical scene. The symbols are related to the theme and include the lifebuoy and six fish of varying colours – purple, striped orange, striped yellow, blue, yellow and green. There’s no wild in Splashtastic! but there is a pearl bonus symbol which we shall explain below. You may have noticed that some of the symbols on the reels appear within white boxes – the free spins are triggered by creating a combo on an active payline containing the pearl on reel two and fish in white boxes on reels one and three. Manage that and you’ll be the recipient of ten free spins and 2x your total stake; during this round you’ll probably gain the biggest rewards by landing the pearl anywhere on reel two which will double the amount of money you’ve already won. Splashtastic! may seem a little on the basic side but it’s a slot which delivers plenty of life and colour as well as the valuable pearl to crank up your wins in the free spins round. It comes with an RTP of 95.25%.